This was our first visit to Thornbury which is just over an hours drive from home. 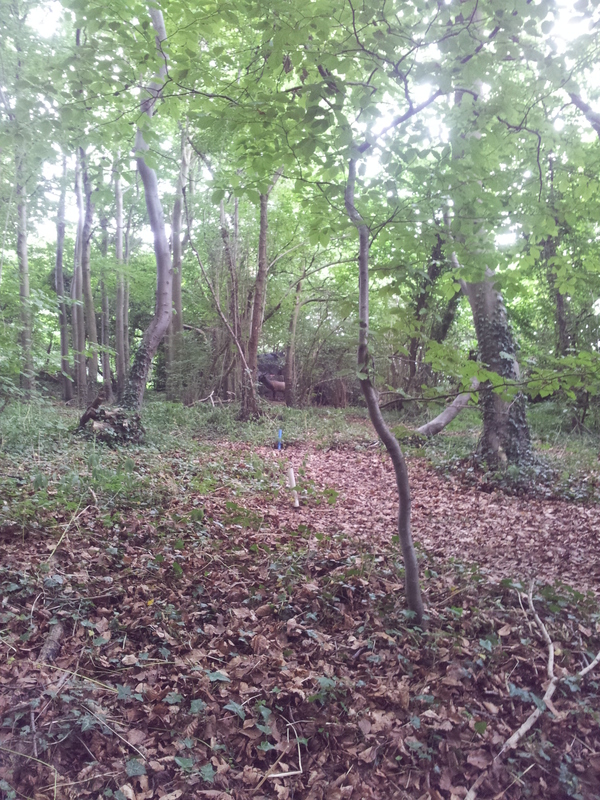 Their ground is a mix of deciduous woodland and rhododendron with the course being made up of 34 mixed targets (3D, 2D and paper faces), yes 34 not 36 or 40, as the wood is quite small. Having said that they make very good use of the grounds, and have constructed a number of tree stands or shooting platforms. 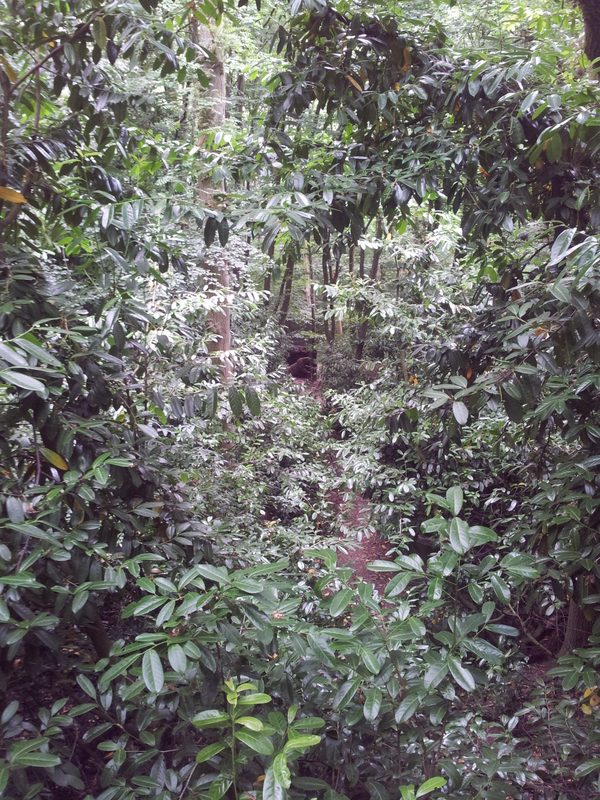 Britain has been enjoying somewhat of a heatwave over recent weeks and we wondered if we’d suffer in the heat so had packed lots of water but we found the woodland very cool and not as humid as our home ground of svyf. This was no doubt helped by the organisers deciding to drain their pond due to the number of insects and mosquitoes. Good call in many ways as the pond is right next to administration and catering and think we would have been eaten alive. This was the first time we had shot in nearly 3 weeks (Hanson being the last time) and it showed, we were both very rusty. 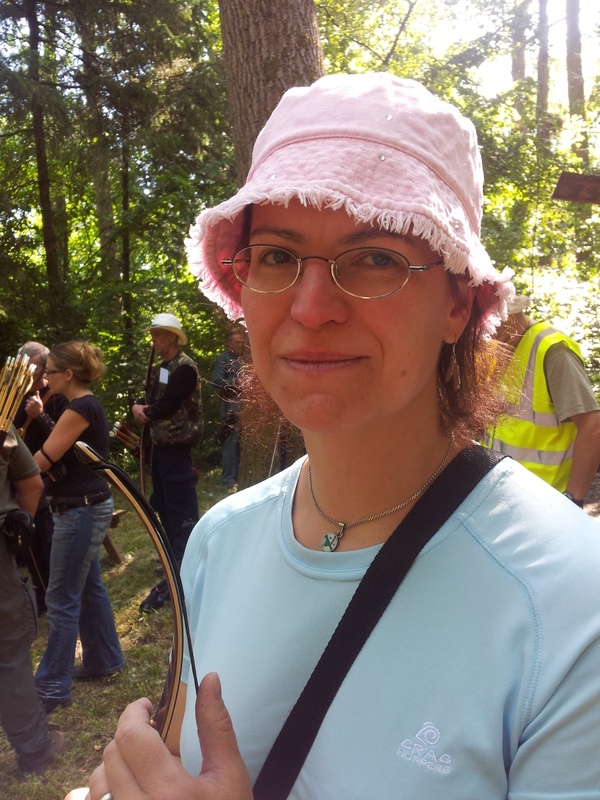 In fact I had hardly touched my bow other than to run a couple of coaching sessions the week before. Add to this, that part way round we discovered that Sharons’ arrow rest had broken, we weren’t doing well. Thornbury was a small shoot by NFAS standard with just over 60 people, which made for a very relaxed and enjoyable day. With only 3-4 on a peg and no forced lunch break time as it was a shoot through, it meant the day flowed well with no hold ups. Our shooting group was made up of Sharon, myself and Pug from Druids club. 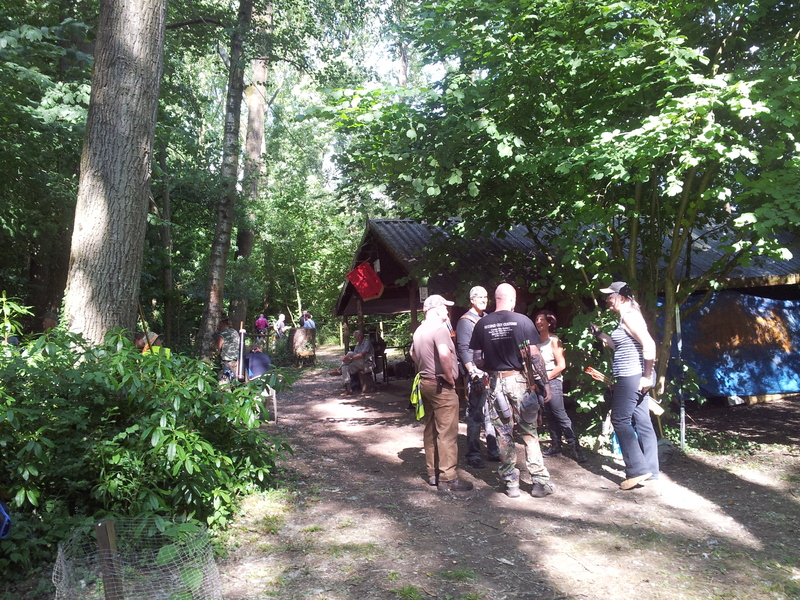 We had a great day, with warm but not hot weather and really good company on a challenging and enjoyable course. Unlike other shoots Thornbury use a public car park at a local leisure centre with a short walk to the wood. This is worth mentioning as the walk is down a main road so please be careful if you attend one of their shoots as drivers by might get a little worried seeing people carrying bows or large knives down the road. Shot settings were well thought out and there were some truly amazing settings. They really had put in a lot of work. The grizzly bear 3D target looked tiny from on top of shooting stand, but was a reasonable distance just set to challenge. 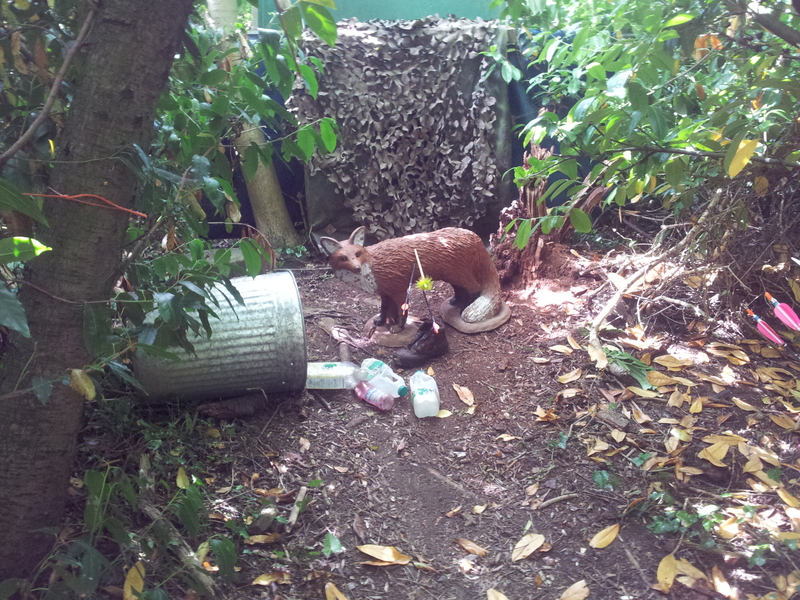 In the UK we have foxes in both rural and urban settings, one target was of a fox 3D set to look as though it was rummaging in an overturned dustbin. Another was a 3d boar where they had mocked up a pig pen round it with straw on floor. Top marks guys. I can not think of any target that was stretched for the distance with some very good use of dead ground. Though one target was a real challenge which was a toy rubber bat suspended on an elastic line dangling in front of a painted moon. You would shoot it from about 8-9 yards. The only problem was if the breeze caught it, it would spin. Catering was good, basic by some clubs standards but not over priced and filling. Organisation was good too with a very relaxed and friendly atmosphere. I think something that helped was they cap shooting numbers at 80ish so they can leave a few empty pegs between groups. This cuts down queuing and hold ups making for a free flowing days shooting. The grounds are a short walk down a public road from a public car park, so consider this when leaving the car park. So how did we do? Okay, but not great. Sharons rest breaking cost her first place and at least 40 points but she still managed 2nd. 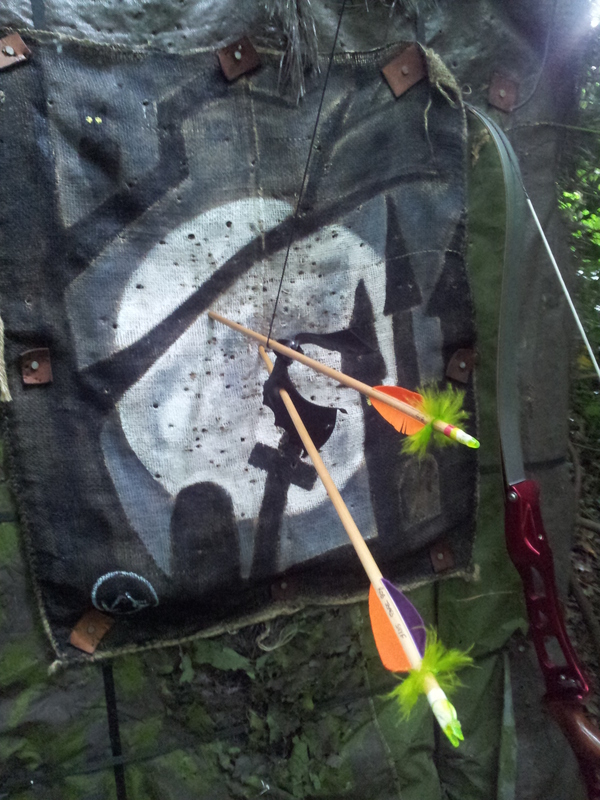 As for me, well no blanks but too many 2nd and 3rd arrows so only came away with a second place.